There are an endless amount of stars in the universe, meaning that there are also an endless number of ways to personalize this image for your tattoo! Stars are some of the oldest symbols in many cultures, religions, and belief systems, making this image one of the most powerful and potent ones out there. these meanings can also be personal: for instance, you may want to get a star tattoo to symbolize a particular goal you're reaching for, or an accomplishment you've achieved. Stars are often combined with other images and symbols to add further meaning to an individual's tattoo, as well as to create a more intricate and interesting design. Star tattoos can also be done in the style of a particular culture's artwork, linking the image to a certain time, place, or the individual's culture. Whatever star tattoo design you decide on, you can be sure it will be special and unique! 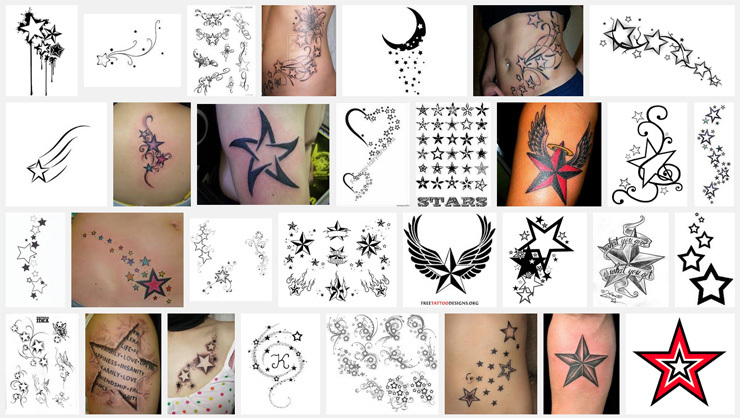 As briefly discussed above, the variations of star tattoo designs are potentially limitless. The meanings they can impart are equally numerous, but also incredibly personal to the individual getting the tattoo. Several popular variations are discussed below, each one of which can be customized to your particular tastes and preferences. A little star tattoo can have a very big meaning - after all, a star is one of the most prevalent symbols in the world's cultures and religions! A great design for a little star tattoo is to get a simple outline of a star; this can be placed almost anywhere on the body, from an ankle to behind an ear, and getting only an outline done will ensure the tattoo is finished quickly and (almost!) painlessly. Another little star design is to get a small, twinkling star done. This can be any color that you want, but simplicity is the key: aim for plain black or yellow (and see below for more on colored stars, see below!). Adding a bit of twinkle can reflect your sparkling personality, or demonstrate that you've achieved something meaningful or important in your life. 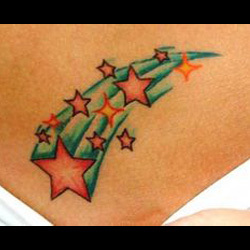 Shooting stars, or comets as they're more correctly known, are often symbols of good luck, and getting this star tattoo design can be representative of your own good fortune in life. Often these designs will feature the comet's tail, which could be a trail of stardust or a series of smaller stars: adding this detail to your design will help it cover a larger area than a little star tattoo would. One great way to personalize this design is to play with color: if you are a stickler for astronomy, you may choose to get only yellow hues done, but if you have a quirkier, whimsical side, consider using a rainbow spectrum color scheme. Chain tattoos are becoming increasingly popular among both men and women, primarily because they can symbolize a variety of things to the wearer. One way to further personalize this tattoo is to incorporate star imagery, which can be done in a few different ways. First, the links of chain can be formed into a star shape, demonstrating that the wearer is unbreakable and cannot be bound. Another way is to have a star pendant or charm placed on a chain tattoo that goes around the wrist or ankle, like a bracelet design. This star can be done in whatever style and color means most to the individual, such as a Star of David if the person is Jewish or a Celtic star if the person has ancestral ties to that culture. This image, which is on the flag of the Philippines, is a popular tattoo design with people of Filipino descent or heritage. 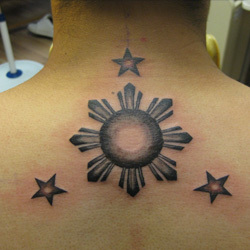 In the image, the sun has eight rays, each of which represents a Filipino province, and each of the three stars represents one of the Philippines' three main island groups. The stars and sun should be a brilliant golden yellow color, if tradition is to be kept, but obviously this color choice is up to the individual. The tribal star tattoo takes two popular tattoo themes - stars and tribal designs - and combines them to make a unique style. In order to maintain the tribal element, these stars should be done in black and be completely filled in (unlike little star tattoos, which can just be outlined). One design you might want to consider is a large circle surrounded by rays, some of which are intertwined (as you might see on a tribal arm band). 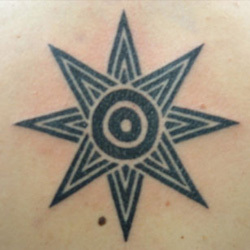 Like the tribal star tattoo, the Celtic star tattoo is a mix of two classic tattoo elements - stars and the Celtic style - into one great design. 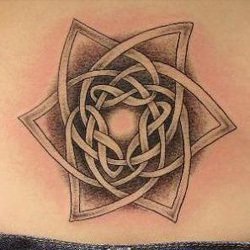 Getting a star tattooed in the Celtic style can link the symbol to one's heritage, or emphasize the meanings of interconnectedness and infinity through the style's trademark interlocking design. One potential Celtic star tattoo design takes the weaving pattern used to make a Celtic knot and transfers that to a star shape: this can be done in a way to make the weave the interlocking threads into a star pattern, or have the more angular points of a star surrounding a traditional, circular Celtic knot. 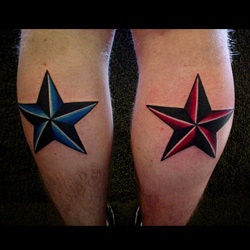 One of the most common colored star tattoos is the red and black star tattoo, which is very popular with members of the Navy and Coast Guard branches of the US Armed Forces. This particular star design combines the shape of the five-pointed star on the American flag and the alternating red and black color pattern of the compass rose found on nautical charts. This star tattoo also represents a sailor's way home, if ever they become lost in life. A tattoo of a pink star often symbolizes one's struggle with breast cancer, and is a great alternative to getting a tattoo depicting the traditional pink ribbon. 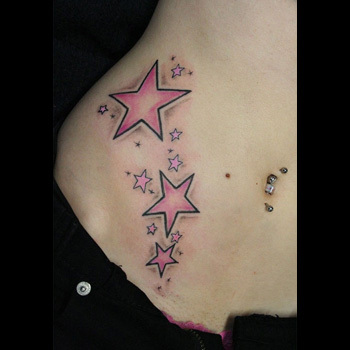 Indeed, when alternated with black in the style of a nautical star tattoo, the pink star becomes an almost 'punk rock' or 'alternative' symbol for one's battle with breast cancer, putting a truly unique spin on the star tattoo design. 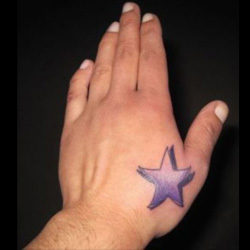 Getting a purple star tattoo is a way of depicting your personality through color and the symbolic nature of the star. The color purple is a combination of the fierce energy of red and the calm stability of blue; purple, therefore, represents balance of the elements and emotions. This may not be the natural state for most people, but a star can symbolize wishes and aspirations: thus, the combined symbolism of the balance of the color purple and the aspirational nature of the star make this a perfect tattoo for anyone wishing to achieve inner peace and balance. 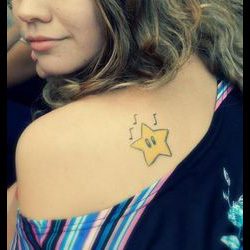 Fans of the classic Nintendo game 'Mario Brothers' will know that this tattoo symbolizes an important image from the games: a star which, if collected, increases a player's speed and makes them invincible for a short period of time. The star's simple design, plain yellow with two black eyes, can be easily customizable to fit your own preferred taste and style. For instance, gamers wishing to express their femininity can put a cute bow on the star, or 'Mario Brothers' fanatics can incorporate other images and characters from the game into the tattoo. You can also get a series of these stars along their body to depict a 'star chain', which appeared in certain versions of the 'Mario Brothers' game to give players even more intense star power. Within animal symbolism, the zebra can represent balance, individuality, and freedom. Its stripes allow it to hide within the long grasses of the African plains, hiding it from predators and offering a means of defense. Those who wish to incorporate the powerful symbolism of this animal with the equally powerful symbolism of the star can do so in a variety of ways. One simple way is to adapt the nautical star design (discussed above) and alternate the points with black with zebra-striped. Other ways to make your zebra star tattoo unique is to design a little star tattoo and then fill it with zebra stripes, or do a series of zebra stars along your body. Butterflies are often seen as a symbol of rebirth, and incorporating these metamorphosing insects with stars can create a unique image that signifies both rebirth and striving towards particular goals, represented by the stars. This particular tattoo is often quite feminine in color and design: vibrant hues of pinks, purples, oranges, and blues are used for both the butterflies and stars, and the stars themselves will often include a twinkling effect. 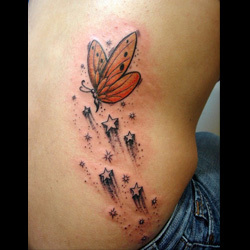 This tattoo can also be adapted to whatever size you want it to be: you could choose to get just a single star and butterfly, or a whole series of stars and butterflies done along your back, ankle, or other part of your body. Clouds symbolize several different things across cultures and mythologies. For instance, in Greek and Roman mythology, the clouds served as the home of the gods, and many people today believe storm clouds symbolize bad luck or danger to come. Depending on what you want the clouds to symbolize, therefore, your stars and clouds tattoo design will mean one of many different things. For instance, a design that incorporates stars into a sky of storm clouds demonstrates that you have gotten through tough times in order to accomplish your goals. Another design would be to have bright yellow stars amid a field of white clouds, symbolizing that those you have lost are in a better place. 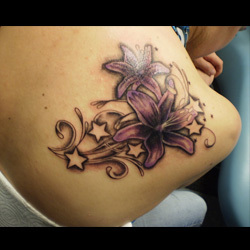 Flowers can represent growth and development, so incorporating this image into your star tattoo design is a great way to add another layer of meaning. Stars are often used to represent goals and aspirations, so putting the two images together can point towards the personal growth achieved while working towards your goals. For instance, lily flowers represented fertility in ancient Greek and Egyptian cultures; thus, a design with a lily and stars can represent a woman and her children. This design can be easily personalized: you can use whatever flower you think best suits your own traits or personality, and there is no rule concerning colors for either the stars or flowers. This design can also be as big or small as you'd like it: from a small inner wrist piece to a full-back design, the possibilities are endless! 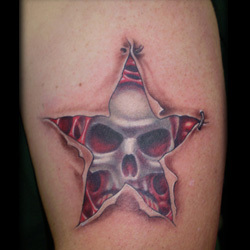 A skull and star tattoo is a must for anyone who loves skulls but wants to incorporate a more layered meaning into their ink. A great design idea is for the star to contain a skull, almost as though it is coming out of the flesh: this can represent vanquishing death or trauma, as the skull is often representative of death and the star the accomplishment of a difficult task. Another design could incorporate the Jolly Roger, the famous pirate flag feature a skull, inside a nautical-style star: this could demonstrate the dual forces that drive our lives, that of searching for freedom and of doing what is required of us. 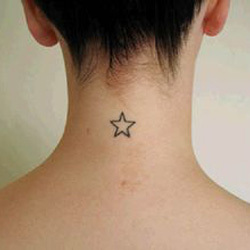 This star tattoo can be quite feminine, and often points to the wearer's fanciful imagination or longing for a better reality. One potential design incorporates a fairy sitting on a crescent moon, with twinkling stars in front of her: the fairy's longing for something more can be seen in her downcast face, with the stars symbolizing the dreams she has for the future. 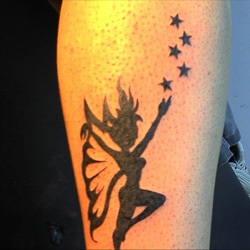 Another tattoo design that's a bit more whimsical would feature a fairy flying among the stars, demonstrating your self-belief and progress towards your goals. Getting a heart and star tattoo is a very fun, positive, and cute statement to the world: life is pretty good and you see the best in things! There are several ways to design your heart and star tattoo. If you want to keep things small and simple, getting outlines of both shapes is a great idea, especially if you have them overlap on one side. 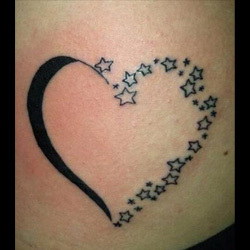 Another design idea is to get an outline of a heart, but with one half of that outline made up of small stars. If you want something more vibrant, choose a design using different colored and shaped hearts and stars to create a great statement piece on your back or side. Music note tattoos are quite popular, but if you're looking for something a bit different, try incorporating a star or two into the design. 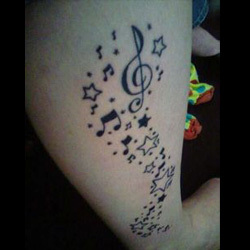 One way to do this is by picking a snippet from your favorite piece of music and tattooing the notes encircled by stars. You could also make the notes themselves into stars instead of circles, perhaps demonstrating your accomplishment of playing a particularly difficult piece. Vine tattoos are incredibly decorative pieces, and have been a favorite image for a number of years. Adding stars to your vine tattoo can add meaning and visual interest, and there are several ways you can incorporate stars into a vine design. For instance, instead of leaves or flowers coming off the vine, put stars instead: this can demonstrate the goals you have accomplished, and the tattoo can be added to over the years to keep up with all of your achievements! Another way to add stars is to have the vine draped over or encircling a crescent moon with stars around the moon and vine, creating a picturesque night sky. Dice are not a mainstream tattoo choice, and by adding stars into the tattoo you'll create an even more unique tattoo design. 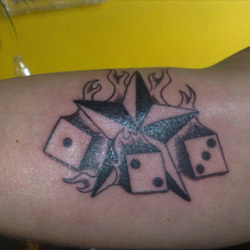 Dice can symbolize gambling, risk-taking, and luck, and getting a tattoo of dice against a nautical-style star can be representative of sailor culture: many sailors, be them pirates, privateers, or naval officers, would play dice and other games of chance in order to pass the time on long voyages. 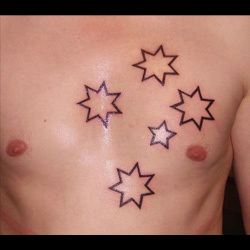 The Southern Cross constellation is depicted on the national flag of Australia, and this tattoo can demonstrate any Australian's national pride and love for their country. 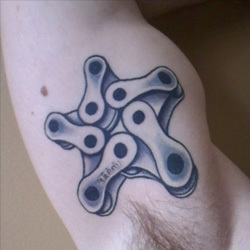 Wearers can choose from a few different designs in order to ensure their tattoo is unique. If you want to emphasize your love for Australia, you may want to get the entire flag tattooed above your heart, or other part of your body such as shoulder or back. For a more subtle design, get just the outlines of the stars tattooed: these can also be placed anywhere you choose, and the size can range from a small constellation on your wrist to an entire back piece. 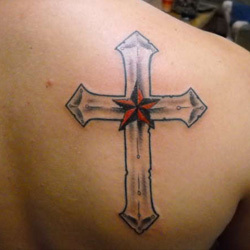 Getting a cross and stars tattoo can be a great way to remember loved ones you have lost, and indicate your belief that one day you will be reunited (as visualized through the Christian image of the cross). One way to personalize this tattoo is to get the initials or birthdate of each person inked inside or around the star, or with a message such as 'Rest in Peace' written below the cross. The Star of David is an important symbol in Judaism, and Jewish people in Hitler's Germany were made to wear a Star of David on their clothing to identify them as Jewish. 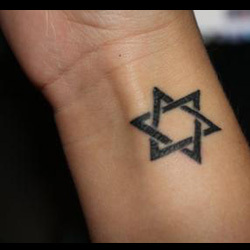 This is a great tattoo for anyone wishing to express their Jewish faith, and it can be easily personalized to demonstrate your own personal faith and tenets of belief. 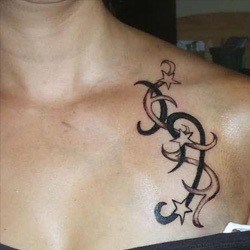 For instance, one unique design would be to get a Hebrew letter or short word inside the star; this could be a word or idea that is important to you, or the initials of someone you have lost. 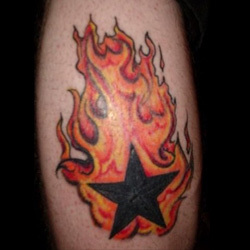 Flames and fire can be incorporated into almost any of the star tattoo designs mentioned above. The element of fire can indicate aggression, anger, desire, transformation and change, and your willingness to burn through anything in order to achieve your goals. Combining flames with stars in your tattoo design can demonstrate that you have forged your own success, or that you have gone through the flames of life and come out the other side even stronger. This tattoo can be as large as you like, with many opting for entire sleeves or lower leg tattoos done in this design, but the image is as equally powerful when done on a smaller scale, such as the shoulder blade or inside a wrist. To help easily differentiate between the flames and stars, keep the flames in their natural red and yellow colors but choose something darker for the stars, such as a deep blue or black: this will make them stand out instantly! Star tattoos are great for both men and women, and are perfect for a person's first tattoo, as you can just as easily design a small and discrete star or an entire constellation: the choice is yours! Whatever style you choose, think about incorporating other images into your star tattoo, such as those discussed above, in order to enhance its meaning and make it even more unique. 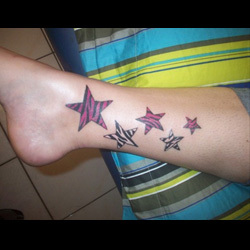 For custom design of a Star, you can check our Custom Tattoo Page.